Effective petroleum-based degreaser containing de-aromatised white spirit and emulsifiers. The emulsifying additive included in the product is biodegradable, which is important from an environmental perspective. A vegetable ester-based alkaline degreaser for removing oils or grease from surfaces. Also contains tensides, complesing agents, and water. This product is entirely without solvents and is biodegradable. 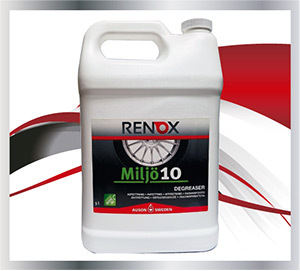 This product can also be used to clean spray applicator for Noxudol 300, 700, 1100, and 720 user.